ATCT PRIVATELY OPERATED BY JOHNSON-BARTON. APCH/DEP SERVICE PROVIDED BY GUAM ARTCC ON FREQS 119.8/269.0 (MOUNT SANTA ROSA RCAG). A110-1 <1000' OVRN S END & 450' OVRN N END RWY 6L-24R. A110-10 DEP VFR ACFT MAINT RY HDG TIL PAST DEP END OF RY AND REACHING 1000 FT AGL; RGT PAT 24L/R DO NOT EXCEED 1500 FT AGL IN TFC PAT. A110-11 CLASS III ACFT ARE PROHIBITED FROM MAKING ANY TURNS ONTO OR OFF TWY GOLF (SOUTH) WHILE UTILIZING TWY ECHO. A110-12 THE FIRST 500 FT OF THE LEFT SHOULDER OF RWY 24L IS NOT VISIBLE FROM THE TWR. PILOTS ARE ADVISED TO CAUTION FOR ANY PRESENCE OF WILDLIFE IN THAT AREA. A110-13 FOR TAXG B747-8 ACFT ON TWY K FRONTING THE ACFT PRKG APN FROM GATES 5 - 16 AT THE MAIN TRML, MAX TAXG SPEED SHALL BE NO MORE THAN 15 MPH. A110-14 FOR THE B747-8, DRG RWY 24L & 24R OPS AND DUE TO JET BLAST EFCTS AT GATES 14, 16 & 18, THE B747-8 WILL BE TOWED FROM GATE 4 ON TWY K TO TWY J WITH THE ACFT PSND ON TWY J FACING TWD RWY 24R. A110-15 DRG TAXG OF THE B747-8 BTN GATES 5 - 16, ALL VEHICLES SHALL YIELD AND RMN CLEAR OF THE VEHICLE TFC PAT AND ARE RSTRD TO A MAX HGT OF 14 FT.
A110-16 FOR ALL ARRS, THE B747-8 AIRLINE WILL TOW THE ACFT INTO GATES 4 OR 18 FROM TWY K AND AIRLINE TO PRVD WING-WALKERS AS THE ACFT IS BEING TOWED INTO GATES 4 OR 18. 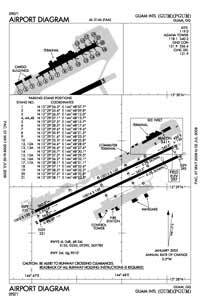 A110-17 ADG-VI AIRPLANES MAY DEPART ON RWY 6L AND RWY 24R WITH ACFT ON PARL TWY K AS LONG AS NO ADG-VI ACFT OCCUPIES THE PARL TWY BYD 1500 FT OF THE POINT OF TKOF ROLL. A110-2 FOR PARKING INFORMATION ALL ACFT CTC RAMP CTL. ALL ACFT DEP TERMINAL PARKING CTC RAMP CTL FOR ENGINE START AND PUSHBACK. 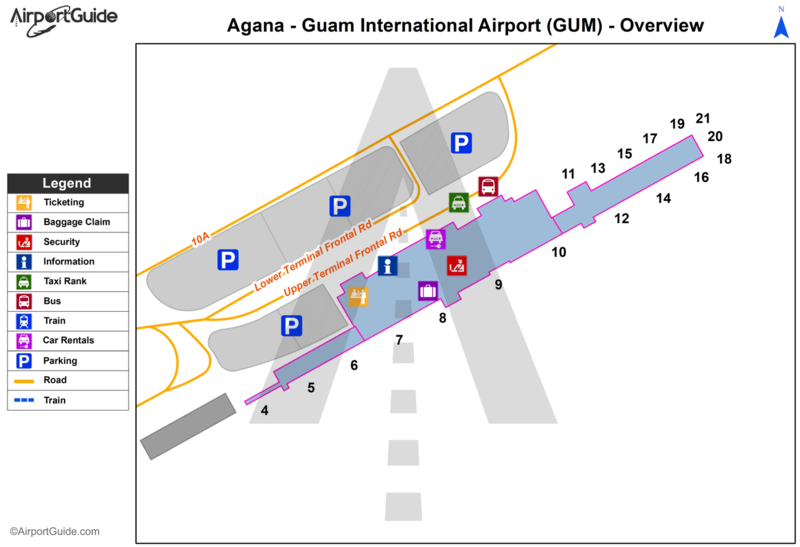 A110-3 TRANSIENT ACFT PROVIDE 24 HRS ADVANCE INFORMATION TO EXEC MGR GUAM INTL ARPT AUTHORITY; 1-671-642-4455 MON-FRI 0800-1700 OR FAX 1-671-646-8823. A110-6 EFFECTIVE RY GRADIENT RY 06L 0.46% UP NE; RY 24R 0.70% DOWN SW; RY 06R 0.80 % UP NE; RY 24L 0.52% DOWN SW.
A110-8 LGTD TWR 780 FT 1.3 NM ENE OF RY 24L THLD . A110-9 RISING TERRAIN 75 FT FM RY 24L THLD 140 FT EAST OF CNTRLN EXTENDED +8 FT.
A14 EXECUTIVE DIRECTOR: CHUCK H. ADA II - OPS MGR: ED MUNA. A23-24R RY 24R & RY 24L DO NOT EXCEED 1500 FT IN TFC PAT. A43-24L PAPI RWY 24L UNUSBL BYD 5 DEG LEFT OF CNTRLN. A61-06L B747-8 DEPS FROM RWY 24R AND TWY J INT THE AVBL TKOF DIST WILL PRVD 11015 FT.